Do you have cringe-worthy content? You’re not alone. Even top selling and award winning authors have published content they’re not proud of. Like you, they had deadlines or other priorities at the time. So they let “good enough” content go. Don’t worry. No one will find them. They’re buried deep in Google’s search results behind more recent and relevant content. It’s the digital equivalent of non-existent. Why not take a break from the content creation hamster wheel to improve these content clunkers? Increase content visibility. Attract different audiences and get new readers since the post was last updated. Support search results. Moz’s Rand Fishkin showed that Google rewards re-published content with improved search rankings. Use less resources. Face it—new content ideas are scarce. This content exists. It’s much easier to edit and revise it than to create new content from scratch. Vox, a ComScore Top 50 media site, tested republishing updated content. Vox did this during the traditionally slow news readership period around Christmas. Their writers reviewed and changed articles that were over 2 months old. Some were minor changes and some were major changes. Vox ran 88 of updated articles during a 5 day period. Together, the articles brought in 500,000+ readers! Like Vox you can drive more readers to your existing content by republishing it. It will extend the life of your content. After one month, daily article traffic drops s to a mere 1.7% of the initial traffic during the first 2 day peak. Tap the power of your existing content by using a mix of these 3 strategies for republishing content. You can republish an old piece of high value content on your own site or blog. This gives it a new date and makes it feel fresh. For transparency, editors will reference the fact that the article was published previously. They’ll add an editorial note either at the top or bottom of the piece. Rationale: You’ve got new readers who haven’t seen it. Therefore you republish it. Some may consider this to be another form of content distribution. 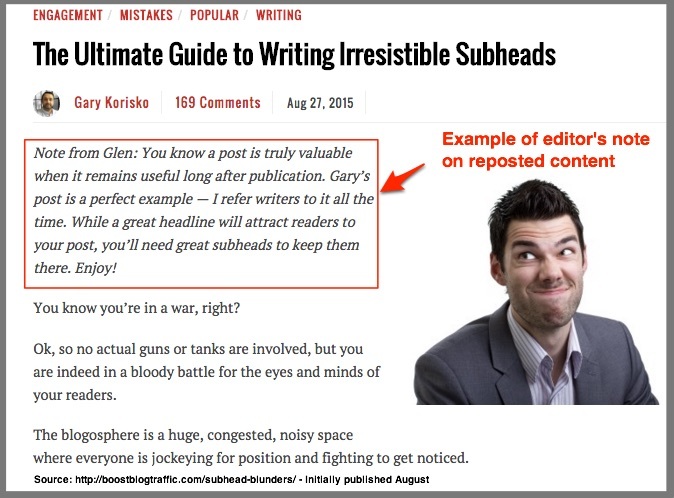 Here’s an example of how Boost Blog Traffic annotates its reposted articles. This article was first published in August 2013 and the information is still useful today. Depending on the strength of other people’s brands and the size of their audiences the content published there may rank higher than your original content on your own media. Depending on your goals, this may be acceptable. Take care to not create duplicate content that Google penalizes. Neil Patel recommends that the second publisher use “rel=canonical” in the reprinted content. This helps Google to know the original source. (Check what Google says about canonical URLs. Like Vox, you can proactively review and change existing articles or content. This falls into one of these 3 types. A. New data. New information has made your content look dated. Update your content to ensure it remains relevant. Rationale: Keep content fresh for readers and Google. B. Change presentation. Your content remains useful but its appearance hinders traffic and branding. You rewrite the title (but keep the keywords!) and add or change visuals and formatting. A more enticing headline or visual increases social sharing. Rationale: Improve content consumption and sharing with optimized presentation. Small investment can yield big results. C. Overhaul. Think reality-TV makeover for an important keyword term. This content needs serious revisions and changes but it’s worth the investment. Rationale: Keep your URL for key search term alive to build longevity. You can convert your content from one format to another. This applies to new content and existing content. Ideally, you create additional content formats during the new content creation process. Jay Baer calls this content atomization. By creating multiple content formats at once, you minimize cost and extend content reach. Due to time and resource constraints (Who doesn’t experience them? ), you may decide to convert existing content into another format once it’s proven to be a winner. This extends your existing content reach. Rationale: Expand your audience by reaching people who prefer visual, video or audio content. 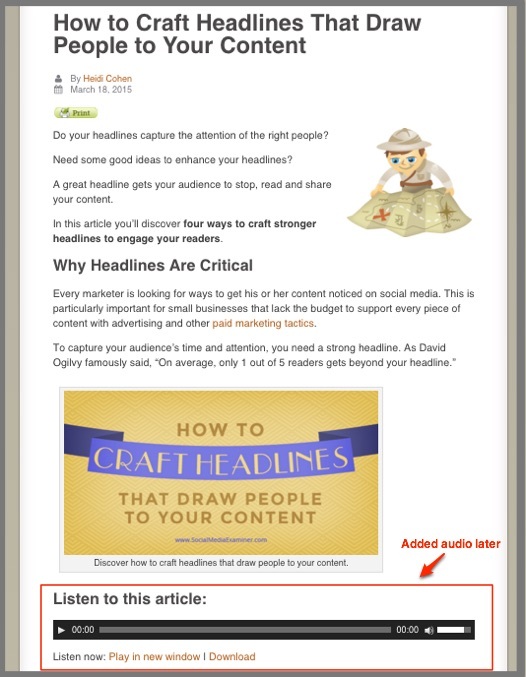 For example, Social Media Examiner adds an audio version of their articles to their top performers. To improve your existing content by republishing it, you must make it part of your on-going content editorial process and allocate relevant resources. This requires less investment than creating new content. Make it part of your editorial process. Here are 3 ways to accomplish this. Based on content audit Track content that needs improvement or updating on a quarterly, semi-annual or annual basis. Based on seasonality. This is important for content related to holidays, seasons and annual events. Often this content has a short period when it’s relevant. Based on results. Enhance or add different content types to your best existing content. While it’s less expensive than fresh content, it still requires resources. Content promotion is necessary to ensure that updated content gets attention. Improving your existing content is a winning content marketing strategy. It helps to increase your reach, improve your search results and lower your content marketing costs. You no longer have to cringe at the idea of less-than-top-quality content. You can always improve it and expand the audience it attracts. Of course, don’t forget to allocate budget to promote your updated content. Have you improved your existing content? What methods did you use and what were the results? Tags Jay Baer, Neil Patel, Rand Fishkin, Vox. Bookmark the permalink. I don’t have any problem at all with republished content, although we haven’t republished any of our older articles yet. If an article’s informative for me to read and contains up-to-date information, it doesn’t matter to me when it was published; however, sites should make sure they always do a quick edit before re-publishing. It bothers me when I click on an article on someone’s Facebook or Twitter page in 2016 and it begins with something like, “As we move into 2014,” clearly showing that it’s outdated. Converting a published content into another format is much appealing if you’re going to post it on your own blog. It adds value to your site’s content since the ideas contained had long been existing and many readers that are familiar with it might just read it again. 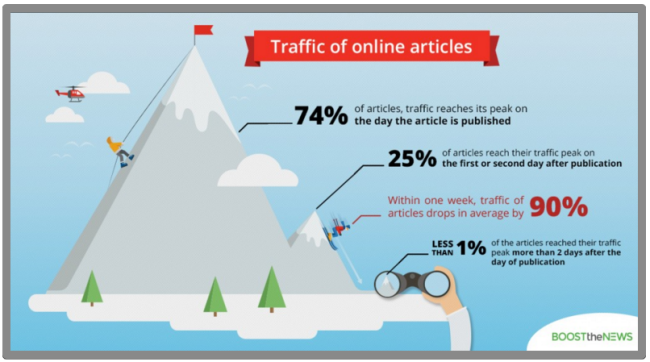 This is really great tips for any content writer because we know that today content is king. But create unique and interesting content is really challenging so we spend too much time for creating content that can go viral. Here you have given some really interesting and easy tips to save time while creating quality and unique content. Surely, this will helps people a lot. Thanks to you for this information and please keep it on.